For the last decade the Palestinian musician Ramzi Aburedwan dreamed of bringing 200 musicians and singers to Jerusalem for a triumphant performance of Beethoven's Ninth Symphony. It was an improbable dream for any single musician, even moreso for this 39-year-old violist who, like most Palestinians, is routinely denied entry to Jerusalem to pray, to visit family, or to play concerts in the Holy City as founder of the respected music school, Al Kamandjati (The Violinist). But what seemed like a crazy dream to others, Ramzi always saw as a strategic challenge requiring careful planning. So it was for the child of the First Intifada, who at age eight, from the refugee camp of Al Amari near Ramallah, hurled stones at Israeli soldiers, to expel them from occupied Palestine. Ten years later, after an older friend introduced him to music, Ramzi began to dream of founding a music school to, literally and metaphorically, protect Palestinian children from those soldiers. Which Ramzi did, against the odds, in the middle of the Second Intifada in 2005. And so putting on Beethoven's Ninth in Jerusalem, when Israel wouldn't even grant him and other Palestinians a permit? When it would require some 150 musicians and singers from Europe and North America to travel to the Holy Land, and risk being turned away at the airport by Israeli authorities, as some musicians were? Or, for Palestinians, to risk prison by sneaking into Jerusalem disguised as tourists or hidden under blankets, just to play Beethoven? To Ramzi, all this was just another challenge. 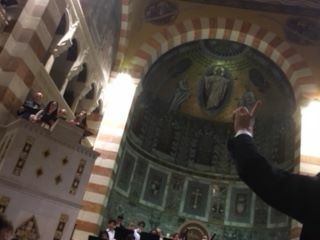 And so, sopranos and baritones, violinists and cellists, woodwinds and tenors and timpanists and horn players all converged in the stunning chapel at the Augusta Victoria Hospital, just outside the walls of the Old City. They came from France and Germany, the U.K., Switzerland, Norway and Slovenia, Japan, Holland, America and #Palestine. And they played Beethoven's Ninth, and they sang the message of universal brotherhood imbedded in the Ode to Joy, in what surely was one of the most triumphant and emotional performances in the history of this magnificent symphony.